New Mexico, billed as the 'land of enchantment', is a geological wonderland featuring everything from the high Rocky Mountain ranges of the north, the Chihuahuan Desert in the south, the great plains in the east, the spectacular canyons of the west and, cutting right through the centre, the Rio Grande, a river much revered in a state were water is sacred. A rich heritage of ancient Native American culture and Hispanic occupation combines under a bright blue sky, making a fascinating and colourful mosaic that quite understandably draws thousands of visitors looking for a destination that brings surprises at every turn, and reveals hidden treasures behind every mysterious rock formation. Originally the home of the Anasazi people, who evolved into today's Pueblo Indians still living in their traditional settlements, New Mexico was also the scene of territorial wars between the legendary Apache and Navajo tribes. 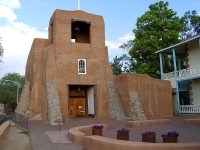 Along came the Spanish explorers and by 1610 the capital of Santa Fe had been founded and settled. Today the dual Spanish and Indian heritage provides for some fascinating historic attractions in the State, and the 'living museums' of the pueblos welcome visitors. The state was also home to some of the most legendary mountain men and notorious cowboys, like Pat Garrett and Billy the Kid, not to mention cattle barons like John Chisum who grew rich rounding up longhorns on the southeastern plains. From cowboys to alien space ships is a big leap, but one New Mexico makes with ease in the town of Roswell in the southeast, where UFO enthusiasts flock to investigate the famed 'Roswell Incident'. Aside from its historic and physical attractions New Mexico has the special appeal of being caught in a time warp. A laid-back attitude prevails even in the cities, and the pace is as slow and languid as the ascent of the myriad of colourful hot-air balloons that fill the skies over the city of Albuquerque in the world-famous annual festival.